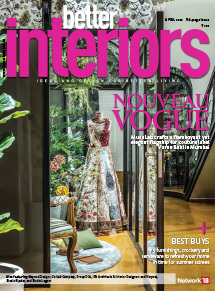 It’s bespoke goodness in full bloom — curated interiors that uses the best of materials and decor pieces sourced from India, a well-crafted menu for the city, and the finest selection of artworks that captures the essence of Mumbai and India. 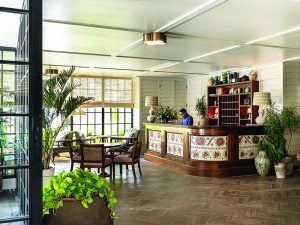 Welcome to Soho House Mumbai, the first in Asia for the UK-based member’s only club. 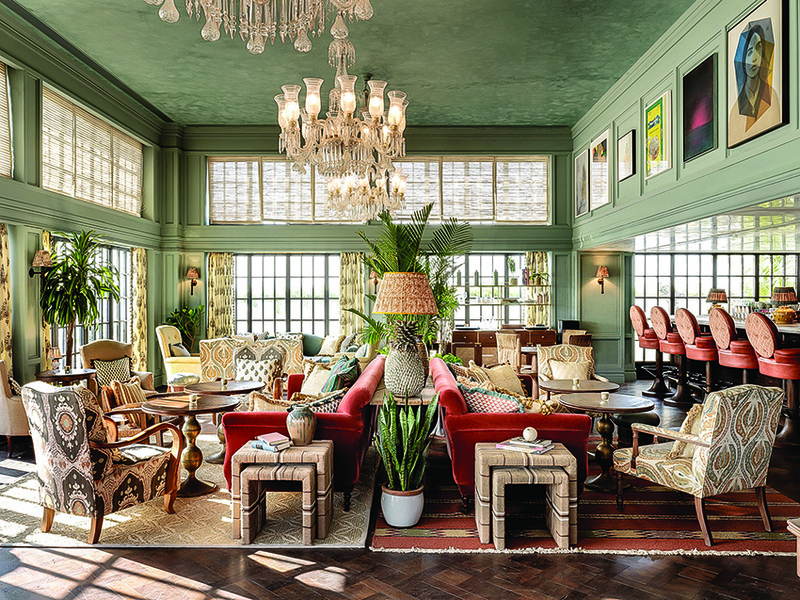 After creating a buzz and offering superlative service to its members in over 22 outlets across UK, Europe and North America, the exclusive member’s club— Soho House — has entered Asian soil. And for their Asian debut, they decided to anchor at the Maximum City for their 23rd House globally. 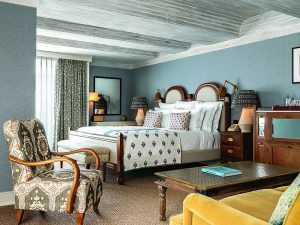 Established in 1995 by founder and CEO Nick Jones, Soho House besides its “houses” also has restaurants, cinemas, spas, workspaces and hotels under their service belt. 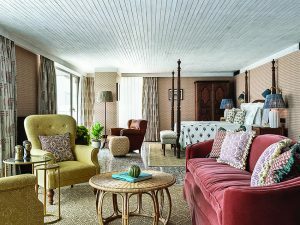 Soho House Mumbai is set in a 11-storey building in Juhu with 38 bedrooms, a floor exclusive for members, gym, rooftop pool, and a 34-seat screening room. On the ground floor, there are two restaurants open to the public: Cecconi’s Mumbai and The Allis. 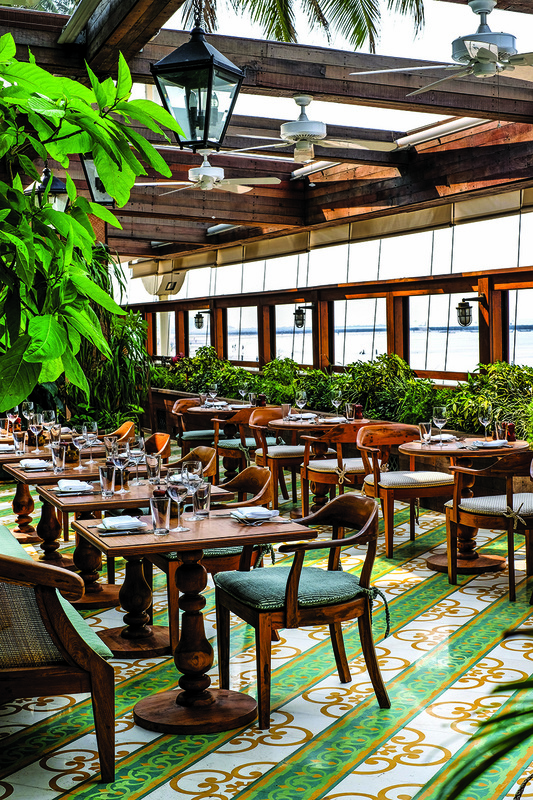 Ceccoci’s Mumbai overlooks the sea and is a bright and happy space. Each House the brand has created reflects the essence of its location but the ethos of the Houses has remained the same — to serve as a second base (a comfortable home away from home) for a community of like-minded people, wherever they are. 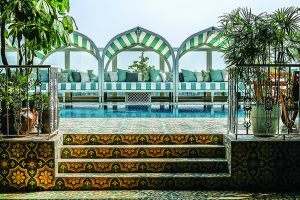 Therefore, for their Mumbai House too, the design team — headed by Nick Jones along with the Director of Soho House Design, Linda Boronkay and Lead Designer, Soho House Design, Scarlett Supple — drew inspiration from Indian culture and the city outside. But before we dwell into design details, a little history on how it all began. “We decided on Juhu as the location as it used to be a weekend destination for Mumbai residents and people built bungalows just off the beach, among the coconut palms. Gandhi stayed there for a while in the 1930s and visited later on,” says Scarlett. “The developer purchased the land adjoining Juhu beach and an old bungalow in around 2000. The development of the new building started in 2006 and was completed as a shell for use as a hotel in 2009. We took over as tenants in 2011, and commenced fit-out in 2012-2019,” she adds. Before commencing on the design of Soho House Mumbai, Scarlett and her team went on a journey to New Delhi and Rajasthan to look at the materials and finishes available to use. “We worked predominately with block printers in Jaipur to create all the bespoke fabrics in the House. We took a lot of inspiration from materials that are readily available to use in India that we don’t get to use in other parts of the world. We used a lot of teak and rattan when developing lighting and furniture designs. We sourced emerald green marble from Jaipur and have used traditional stones from north India,” Scarlett explains. 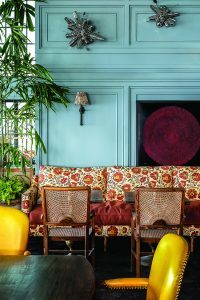 As for the hues which finally made it to the palette… though the design team loves the use of colour in India, they consciously used hues that worked with the Soho House aesthetic. “The look is also partly influenced from the beach which is in close proximity to the property. We tried to keep the walls fresh and light in The Allis bar and used more colour in the main club spaces,” Scarlett asserts. As for the gorgeous artefacts used in the property, most are antiques sourced from Mumbai. 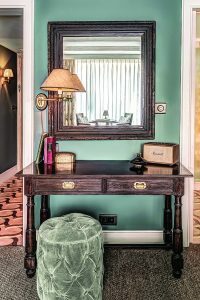 “We restored and used a mix of traditional colonial and art deco furniture from all over India along with some antiques which we sourced from France. We also gathered a lot of brass pieces from the local markets in Mumbai which helped build the layers of the design,” explains the designer. 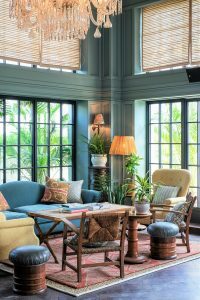 This carefully curated material and colour palette is beautifully woven into the DNA of Soho House Mumbai… and though Scarlett and her team have ensured that each facility has its own character, the design does not waver from its core thread. 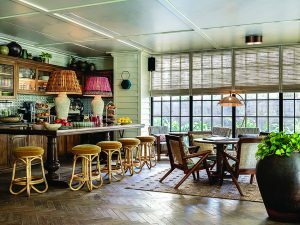 Take for instance The Allis, a lounge and cafe on the ground floor (which is open to everyone) where you’ll see lovely white panelling with a reclaimed timber herringbone floor, Indian textiles and handmade rugs. 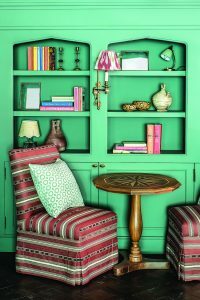 Vintage rattan furniture, Jaipur green marble bar tops with panels of bold printed fabric on the front and patterned ceramic tiles fill the space. 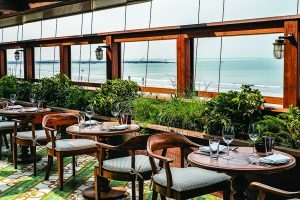 Another open to all restaurant, Cecconi’s Mumbai, is privy to the Juhu beach and has a large outdoor terrace overlooking the sea. 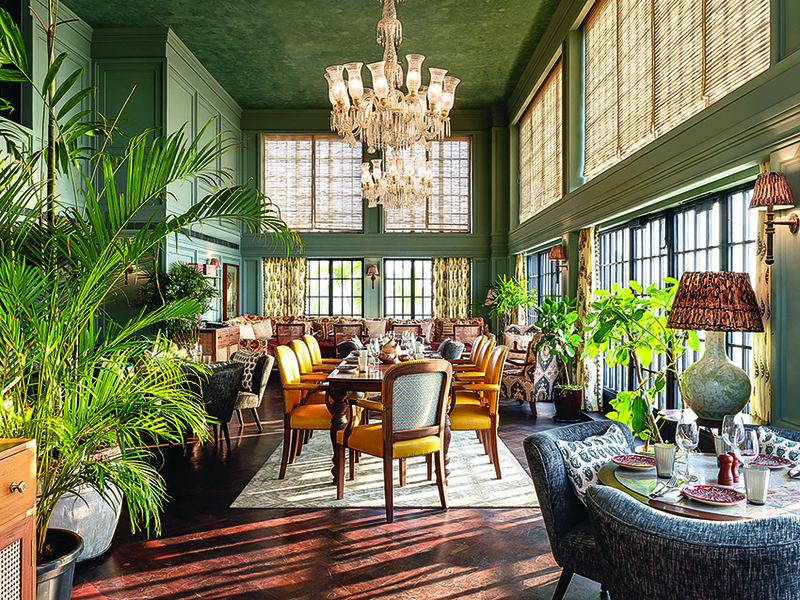 The restaurant has glass chandeliers, warm timber and rattan panelling with antique Indian handmade brass lights. There is an L-shaped marble bar and a seating area with leather banquettes and Indian cut-glass lights. More rattan chairs, tables and plants line the terrace. 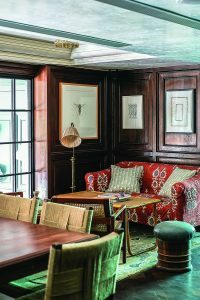 The main member’s area is spread across the eighth floor and has a luxurious double-height ceiling which features old-worldly cut-glass chandeliers and antique teakwood flooring. 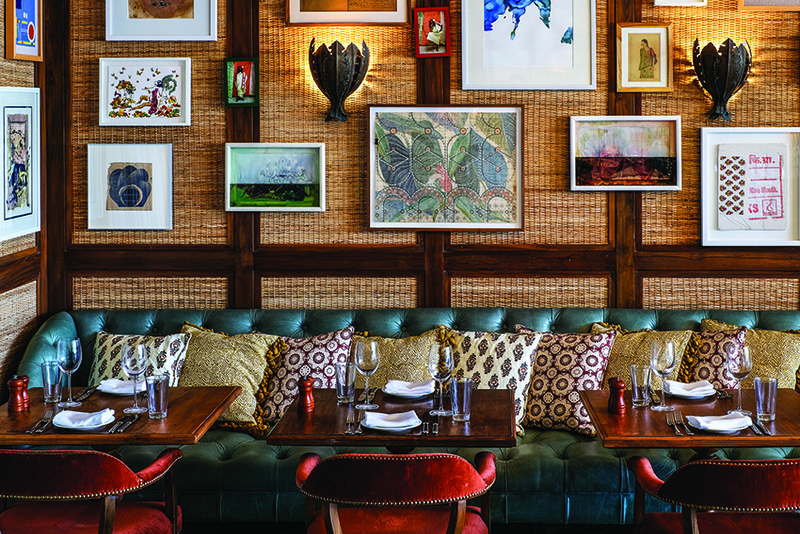 There’s a mix of antique furniture with pieces by Soho House Design on either side of the bar for lounging and dining. The designer has incorporated tropical planting here to create a very relaxed and warm, almost home-like ambience for the members here. Note the large tree in the dining area which was introduced as an element of surprise. On the first floor is the 32-seater screening room and the multipurpose Eva room, which is fully equipped with a 12-ft bar, high-tech sound, light and projection systems. The House Gym, on the second floor has Technogym & Watsons equipment, a group fitness studio, steam rooms, laundry facilities, an outdoor workout space and a House press juice bar. On floors three to seven, the 38 bedrooms vary in size with two Playroom suites. Each one is individually designed with eco-friendly sisal carpet flooring, antique timber and bone inlay furniture and lampshades created from vintage sari fabrics found in nearby markets. The bathrooms have coloured cement tiling, vintage mirrors and marble fittings, with a full set of Cowshed products in each. The eighth floor is the main members’ space, with high ceilings, cut-glass chandeliers and teak floors. 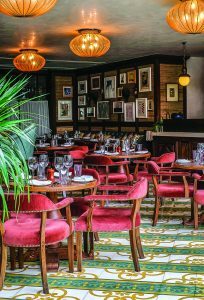 The bar, in the centre of the room, has antique mirrors, glass wall lights and leather bar stalls. 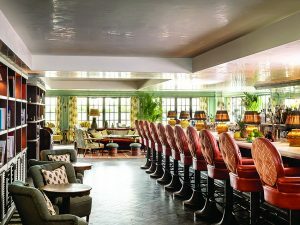 There’s a mix of repurposed furniture with pieces by Soho House Design on either side of the bar for lounging and dining. The outdoor balconies have more seating areas with views out over the sea and city on either side. The library on the ninth floor overlooks part of the members’ space below, with floor-to-ceiling windows. 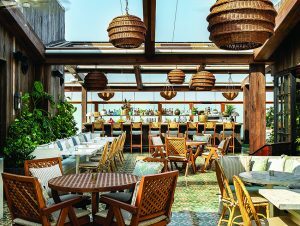 On the rooftop is a bar and restaurant with views of the city on the east, and the Arabian Sea on the west side. 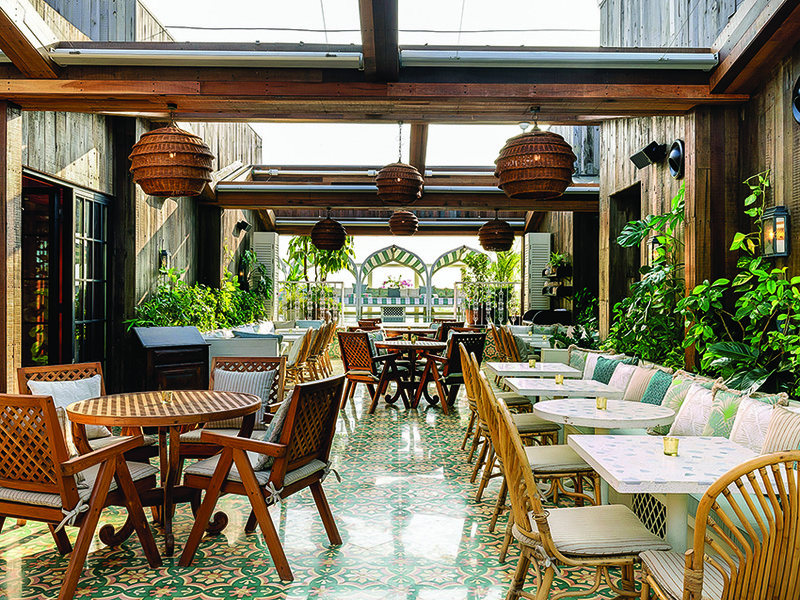 Outside, the space has traditional Indian cement tiles, walls clad in reclaimed sleeper wood and retractable awnings overhead. 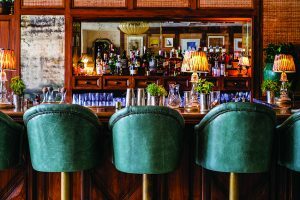 Here you’ll find a colourful marble-top bar with terrazzo tables, locally produced cane furniture and a relaxed seating area. On the upper level is the rooftop pool with striped sunbeds surrounded by plants. When you walk through Soho House Mumbai, one aspect follows you right from the entrance, and will meet you at regular intervals in the property — a stunning collection of artworks. Curated by Head of Collections of Soho House, Kate Bryan, over 200 works of art — where over 80 per cent of the artists are from or based in South East Asia — feature here making it one of the largest global art collections on permanent display. “It is really important to Soho House that the artwork reflects the city. This collection mostly comprises works by Indian artists and many are from Mumbai. We have exceptional pieces by Bharti Kher, Subodh Gupta, Thukral and Tagra and more emerging artists like Princess Pea. This means we have artists of different stages of their career and usually from very different backgrounds alongside each other. It makes for a very diverse and unique kind of display — you wouldn’t find it quite like this anywhere else,” informs Kate. 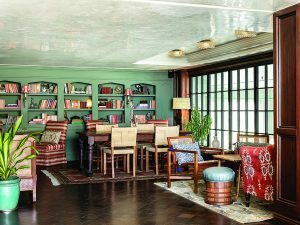 It’s not just the wonderful environs, decor and art of the Soho House Mumbai which is impressive; the House also makes a curated (bespoke) list of events for members, covering a range of creative categories — food and drink, art, design, fashion, film and music. Now, what more can you ask from a home, away from home? 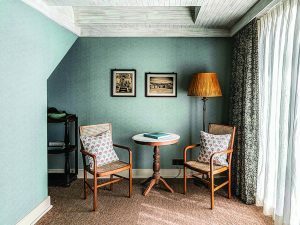 To design the Soho House Mumbai which celebrates the city and the country in its interiors and artwork. 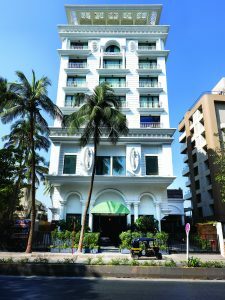 The architecture of the 11-storey Soho House Mumbai has neo-classical influences. A cosy corner in the main members area on the 8th floor. The Allis is open to the public. 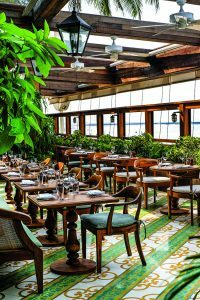 Strong Crittall steel windows, which bring in natural light, and the abundance of potted plants used in the decor keeps this restaurant fresh through the day. 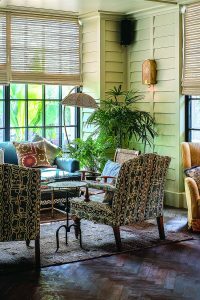 You’ll witness a beautiful synergy of materials here: teak herringbone flooring, white washed slatted walls, teak furniture with ikat textile panels, large ceramic lamps, hand block-printed cushions, vintage sari lampshades and carefully picked out antiquities. Open from morning to night, this lounge and cafe serves hot drinks, juices and small bites. Mumbai has its own Cecconi’s now like the ones in London, New York, Miami, West Hollywood, Istanbul, Barcelona, Berlin and Amsterdam. Accommodated on the ground floor facing the beach on one side, it is open to the general public. One can have delicious cicchetti, pasta and pizzas made in the wood-oven while sitting in a lavish design scheme which boasts of glass chandeliers, timber and rattan panelling and handmade brass lights. There is an L-shaped marble bar and a seating area with leather banquettes and Indian cut-glass lights. 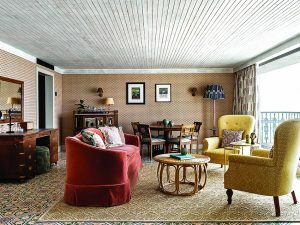 Note the walls here… which see a wonderful collection of artworks selected by Kate Bryan, Head Art Collector, Soho House. The bar in the centre of the main member’s area has antique mirrors, glass wall lights and leather bar stalls. The outdoor balconies have more seating areas with views out over the sea and city on either side. The design team used an blue for the walls and block-printed fabrics and bold block colours for the furniture. A mix of bespoke teak wood and cane furniture, lighting and tailor-made rugs were also used in this space. The library has traditional teak wood panelling on one wall and a smoke green hue on the other. The built-in shelving here is inspired from a vintage piece of furniture. Dark teak wood flooring and gorgeous timber inlay tables and traditional Indian prints on furnishings are other highlights. The Eva room is available for members and non-members. This multipurpose events room is ideal for intimate gatherings and celebrations, workshops and talks. 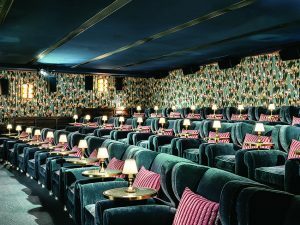 The screening room has 32 armchairs made in mohair and local Rajasthani hand-printed block fabrics, with footstools side tables and a menu with drinks and snacks that can be ordered for the film. 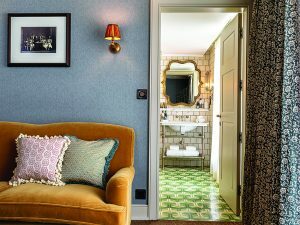 The largest of the bedrooms are the two Playroom suites which are lined with an Indian motif wallpaper with cement tiles and sisal rugs on the floor. 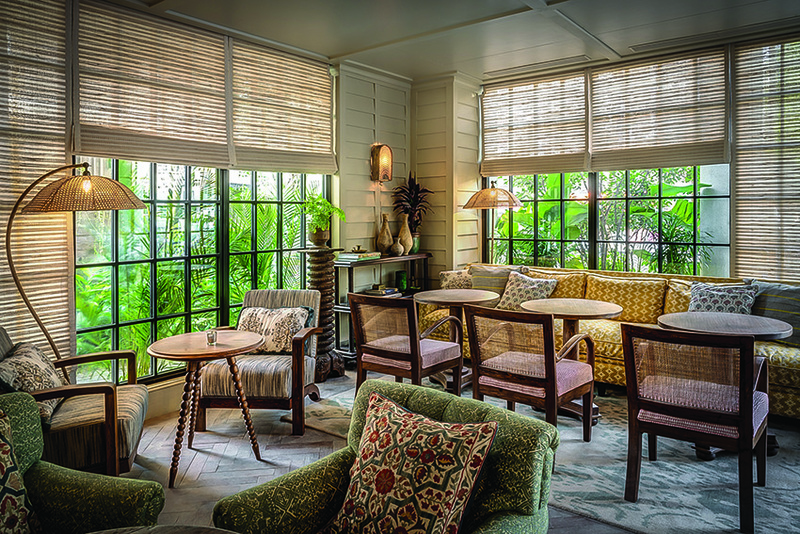 Patrons are treated to a world of soothing luxury — bespoke four poster beds with cane headboard and antique mirror bedside tables; block-printed fabrics for bed linen, trims and textiles; bespoke brass lighting fittings and antique pot bedside lamps; cane dining chairs; arched timbre slatted ceiling; and bathrooms with deco cement tiles and swanky fittings. The Big bedrooms have a sisal floor carpet, painted walls and white-washed arched ceilings. A bed with a high headboard and cane tables form the custom-made bedroom set-up. Bespoke brass light fittings and lamps, hand block trims and textiles and handmade bed throws complete the look. 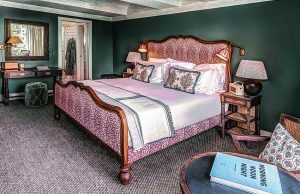 The Small room has all the comforts and opulence of the other rooms and is replete with bespoke beds, furnishings, lighting fixtures, furniture, artworks -and linen.